Even though it should be almost like daylight at 9 PM up here, the fog was so thick it felt like it was night time in winter. 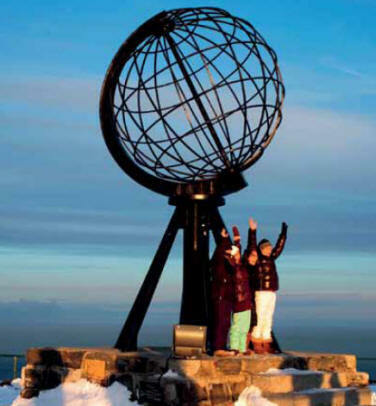 It was a little scary as I drove the 16 miles of winding roads to finally arrive at the so-called Nordkapp center. We have no idea what it was we are going to see here, but here we are. The fog was so thick in the parking lot you could barely see the cars in front of you. 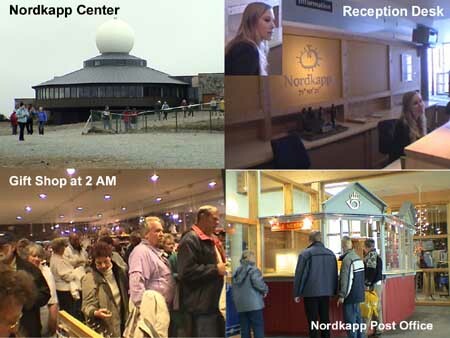 We wended our way to the main Nordkapp Center building and were glad to finally be inside and open up our jackets. From the reception desk we learned that there would definitely be no midnight sun tonight. Oh, well, we saw it best in Tromsø. By 9:30 we were exploring this large complex heading for the special movie they have on the area. We had to descend several stairs to find the theater and then wait in this huge line. I thought it odd, that here we were in this totally remote place in the world and we were waiting in line to see a movie. The line was almost as bad as those to see Star Wars in Westwood. At 10:00 we got in to see the film which was a triple screen wide panorama movie shot from an airplane. It was quite spectacular since this may be the most of it we will ever see. On the right are clips from the video I took of the movie. Later I saw the line was still long at one o'clock in the morning. 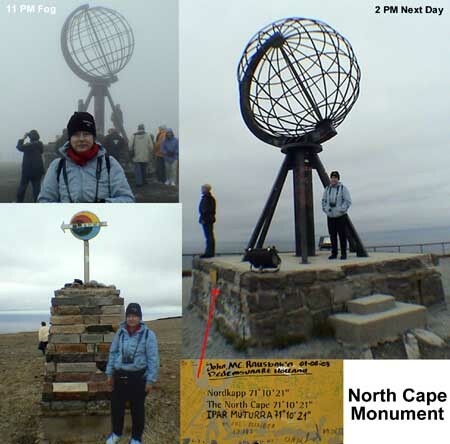 We got out at 11:00 and headed outside into the fog to go to the end of the cape where there is a large metal globe (see below) near the edge of the cliff. It was light out but the fog was very thick and it was cold. After taking some pictures we headed back inside and explored the complex. Below is a stock photo of the globe. We looked in at the restaurant which had now winded down and saw the remains of the seafood buffet (below left) which looked pretty good. 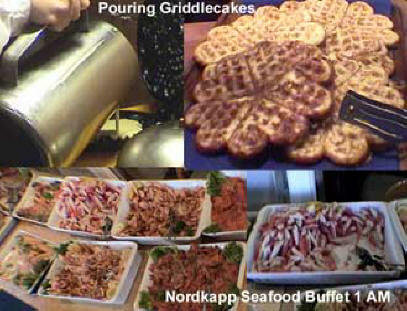 We went by the counter where this Norwegian girl was cooking griddle cakes. We split one to try it and it was very good. We went back down stairs and discovered the St. Johannes Kapell (St. John’s Chapel) which has to be the most northern religious place in the world (above right.) 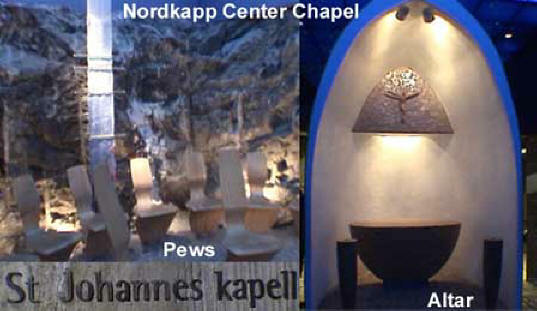 It was very cute with its little wooden chairs and stone altar. 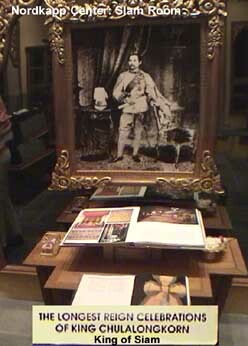 Around another corner was a special room donated by King Chulalongkorn of Siam, who had visited here. He had the longest reign in Siam of any ruler. The room was quite splendid with much memorabilia from his reign including a suit of armor. Along the walkway back to the main hall, there was a series of dioramas depicting many of the explorers and events that occurred here. One was especially interesting. 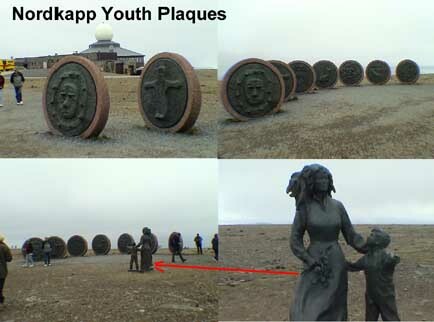 It depicted the English ship "Edward Bonaventure" off North Cape in August 1853 looking for the North West Passage to China. Its captain, Capt. 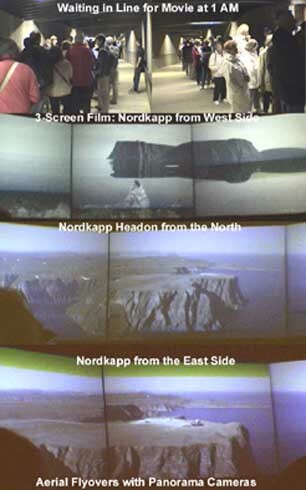 Richard Chancellor gave the name to North Cape. He had 48 men on board his ship; seamen, soldiers, a priest, a doctor, tradesmen & merchants. They lost two of their accompanying ships and landed on Murmansk Coast (Russia) and tried to survive the winter. All of them died except Chancellor who survived and landed at Archangel in Siberia. He sledded all the way to Moscow where he met Tsar Ivan the Terrible and this became the beginning of the English Moscovie Company which 50 years later concentrated heavily on whaling. By 11:15 we went past the most northern post office in the world and the gift shop which was packed with people. It was a literal madhouse. We shopped around and then decided to head back the 16 miles to the hotel. At 11:40 Marcia drove back to the Árran and by 11:50 I was working on photos and finally got to sleep at 3 AM. The next morning I awoke at 5:30, 7:15 and 9:00. I finally got up at 9:30 and I went over to the main hotel building where we ate last night just to get a cup of coffee but the fresh homemade waffles they were offering looked just too good to pass up. So after having a rare breakfast of waffles, I worked on photos until Marcia was ready to go. We checked out of the hotel at 10:00 AM. 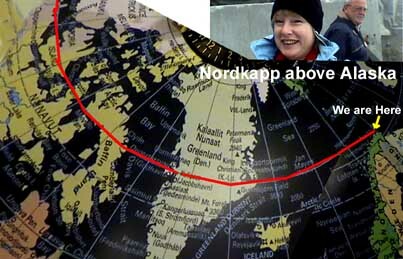 We were now ready to head south toward Finland but as we got to the road intersection, I got the feeling that the Cape might be more clear today and persuaded Marcia to make the 33 mile round trip back up to Nordkapp. When we got there I was sure glad we took the extra time to try again. Though not a bright sunny day, the fog had lifted quite a bit and we were able to see much clearer the things we looked at last night. We could see the spectacular size of the Nordkapp rock jutting out into the North Sea (my photo above) and the Center and the Globe (left.) 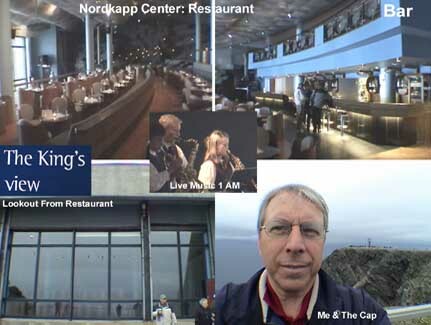 Outside the restaurant is what is called “The King’s View,” which is a large viewing area looking out to the North Pole. The exact position here is 71° 10' 21". We were glad we saw all the interior things last night including the movie which we would not have been up for in the daylight. Outside the Center we saw this unusual series of huge metal disks arranged in a circle. 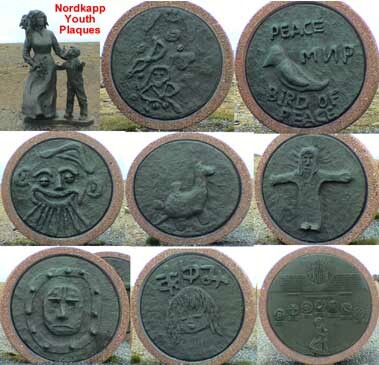 They were large metal castings surrounded by stone of drawings made by children. In the center was a statue of a woman with a young child. I picked up some rocks from the ground as souvenirs. Having seen and photographed just about everything it was time for us to head south. 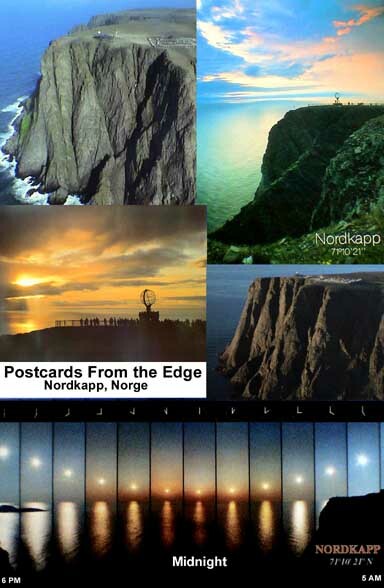 On the left is a collage of postcards from Nordkapp. Marcia drove south back to Honningsvåg but along the way she had to come to a sudden stop as there was a large male reindeer walking across the highway. We also saw large areas covered with snow. The scenery was quite spectacular as we headed past Honningsvåg on our way south to Olderfjord.